The Division of Water, as part of its triennial review of water quality standards, is proposing to add 20 new waterbodies as outstanding state resource waters (OSRWs) and 13 new waterbodies as “Exceptional” waters. The number of waterbodies included as OSRWs and “Exceptional” waters are good indicators of water quality improvement. 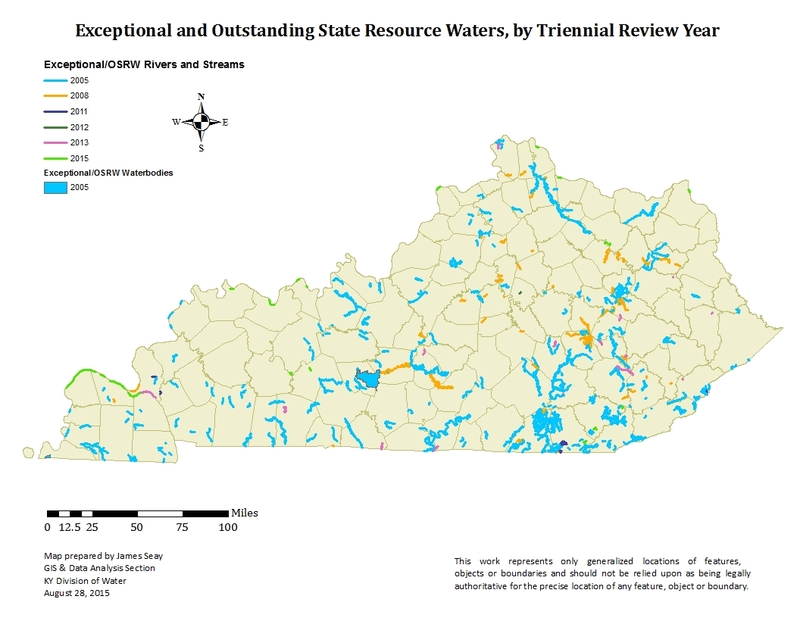 The list of OSRWs, which include the highest quality waterbodies in Kentucky and those waterbodies that support threatened and endangered species, has grown from 157 OSRWs in 2008 to 423 designated OSRWs in 2015. The list of “Exceptional” waters, including Reference Reach Waters has also grown, from a list of 118 waterbodies listed as having “Exceptional” water quality and aquatic habitats, to 254. Grants totaling $1.58 million are available for projects that help clean up polluted streams, rivers, lakes and groundwater and for projects that protect water resources. The grants are for watershed restoration projects and for watershed plan development as well as for other projects that reduce and prevent runoff pollution. Runoff pollution, also known as nonpoint source pollution (NPS), is the No. 1 contributor to water pollution in Kentucky, accounting for nearly two-thirds of the impaired rivers, streams and lakes in the state. Runoff pollution occurs when water runs across the land and carries sediment, nutrients, pesticides, metals, and animal and human waste into streams, rivers and groundwater. The Kentucky Division of Water (DOW) administers the federal NPS grants, which are funded through Section 319(h) of the Clean Water Act. The funds are provided by the U.S. Environmental Protection Agency and can be used to pay for up to 60 percent of the total cost for each project; a 40 percent nonfederal match is required. The DOW gives priority to projects involving watershed plan development and implementation in impaired waters, as well as the protection of Special Use Waters (e.g., cold water aquatic habitat, exceptional waters, state wild rivers and federal wild and scenic rivers) with identified threats. The next meeting of the Floyds Fork Technical Advisory Committee (TAC) will take place Wed., Nov. 28, from 9 a.m. to 3:30 p.m. at the offices of the United States Geological Survey (USGS) located at 9818 Bluegrass Parkway in Louisville. The committee is a component of the joint effort by the Kentucky Division of Water, the U.S. Environmental Protection Agency and stakeholders to improve water quality in the Floyds Fork watershed. The committee is composed of technical representatives from the major stakeholder groups within the Floyds Fork Watershed. The group was created to address high-level technical concepts regarding the development of nutrient total maximum daily loads (TMDLs) for Floyds Fork. Meeting topics will include development of the Floyd’s Fork bacteria TMDL, results of DOW’s monitoring efforts in the watershed, scenarios to be used in nutrient TMDL development and discussion of subcommittee topics.